Whether you have a stream, river, pond, lake or fishery, Mayfly Aquacare can provide you with a management plan which will give you ideas & information on how to improve many of the elements that make up your waterbody. We can advise and apply the practical restoration and rehabilitation of your waterbody, using a variey of techniques. 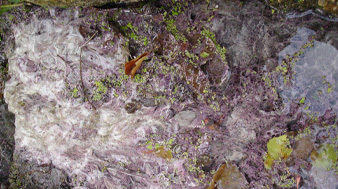 Ranging from the application of siltex/microchalk to increase the productivity and stability of an aquatic environment, plant and fish removal or stock enhancement, the use of bacterial silt digesters to compact silt without dredging, or bank reinstatement by re-grading and planting or using established coir products. This is but a few of the habitat enhancement services we offer, please contact us with your problems or requirements. Analysed samples from your waterbody provide us with an accurate chemical composition of your water. Imbalances here provide an insight to problems further down the line. From this we can create a remedial plan and provide a solution to the problem, before it occurs. We will travel anywhere within the uk to net and or electro fish your water, either for survey data or as a culling operation. Fish can be held on site using our temporary holding facilities (to allow for health checks and ageing), or removed to other waters. 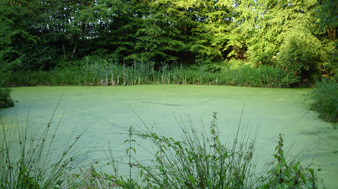 Trapping is an often overlooked culling method for ponds and lakes. We have traps suitable for catching fish, crayfish and eels, these can be hired along with a setting up, monitoring and removal service, or if you prefer we can supply the traps for your own use. We can arrange and carry out standard health checks to support a stocking consent or for a more in depth check, testing for viral and bacterial pathogens can be carried out. A goldfish/carp hybrid with a large tumour removed from the body cavity. This fish was caught in a survey netting on a match fishery. Hybridised fish are often more susceptible to tumours like this This emaciated tench had a large number of ergasilus sieboldi on its gill filaments. It is approximately 10inchs long and 2 inches deep. Tench are very susceptible to this parasite, as the picture shows their condition deteriorates substantially, they become weaker and eventually die. This fish also shows signs of eel damage. There are medicines available to treat category 2 parasites, please contact us for more information. We work with a number of fish biologists who can advise and provide treatment methods along with fish care services. Typically this would entail a site visit and survey, followed up with outline drawings and site levels, liasing with planning officers/agencies and the submission of detailed drawings and planning application forms. We can be involved at every stage from start to finish, or simply assist with the design or planning. Restoration & newbuild of ponds lakes and fisheries. Please click on the pond and lake page for information on this section and also in our portfolio page for pictures and information on projects we have completed in the past. Water had worked its way around the sides of this concrete spillway, which (if it had not been caught in time) would have washed out and undermined the concrete and caused the spillway to collapse. Local clay was packed around the sides of the spillway and re-graded. Well established carex (sedge) coir pallets were pinned to the bank. The carex roots travel through the coir and into the bank holding it all together. Unless you know what swims in your water it is hard to effectively manage it. 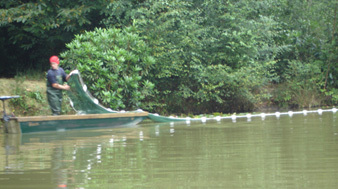 Other techniques, such as Netting, electro-fishing, fishing (& collating catch data), trapping, visual assessments and water quality are used. These singularly will not provide a detailed assessment of the stock but together they provide us with a relatively accurate profile of what is in the water. 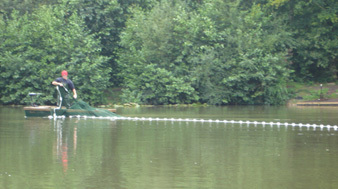 Netting an easily drained (and filled) lake to carry out a stock assessment and removal of golden rudd. A small coarse fishery partially drained, exposing underwater snags, shelves, deeper areas, overhanging rushes and undercut banks. Without partially draining this fishery the odds of successfully catching fish are greatly reduced.